Two years ago, when I embarked upon my plan to tour Chicago's great churches and religious sites, I never would have predicted that I would still be at it today. I had envisioned the project with a relatively short list of sites that I thought I could check off in short order. However, I quickly learned that American churches are difficult to visit unless you want to sit through a service, and once I moved to the far north side of the city, it was suddenly much more difficult to get to the churches in order to see them. That's what makes Open House Chicago so great for me; dozens of ecclesiastic spaces open their doors for an entire weekend, with zero pressure to do anything besides appreciate their beauty. Though Loyola University Chicago was founded in 1870, it did not move to its present location along the lakefront until the 1910s. It took another decade for school officials to begin a fundraising campaign to construct a chapel for students at the site, and construction did not begin until 1938. Architect Andrew Rebori was selected to design the edifice, having already completed the university's Cudahy Library, so that the buildings would be complementary. Madonna della Strada, or "Our Lady of the Way" was named after the first Jesuit church in Rome, where the order was founded. Despite that homage to the past, Rebori took a distinctly modern approach to the design for the Loyola chapel, drawing his inspiration from the style of Art Deco, the internationally prominent decorative and architectural style of the 1920s and 30s, as opposed to classical or even medieval ecclesiastic precedents. The lakeside facade of the building is intended to capture the essence of the Blessed Sacrament being held toward the heavens in benediction. I personally don't see it, but the strong vertical lines, clean curves, and geometric motifs definitely capture the spirit of Art Deco, along with the font used in the inscription over the entrance. Inside, the building was filled with light, though the priest who was there to answer questions indicated that much of that lighting was a result of a renovation circa 2006-2007. Prior to that, the primary sources of light were the north and south facing stained glass windows, and a series of small glass panels tucked away into the crevices of the sanctuary, only visible from a specific angle. Apparently, the goal was to have indirect sources of light, in order to create a sense of heavenly mystery. A scene from the Passion. Those robes they're wearing are so angular, they look like they could stand up by themselves. Definitely not your standard-issue ecclesiastic artwork. 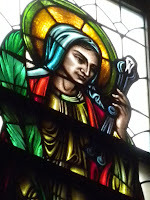 Ordinarily, I am a sucker for stained glass, but the ones inside Madonna della Strada felt incongruous to me. Whereas the painted altar and murals are full of angular lines and structurally draped fabrics that looked like something straight out of a WPA project, the stained glass was designed in a classical style and imported from England. They were really the only element of the entire building that harkened back to the traditional language of ecclesiastic art and architecture. While the windows along the southern side of the building depicts such traditional religious fare as the apostolic works completed by the Jesuits and their most significant saints, the north side features the patron saints of Loyola's various schools at the time the windows were completed during the 1950s. My personal favorite was Saint Apollonia, the patron saint of dentistry, and therefore Loyola's now-defunct School of Dentistry. 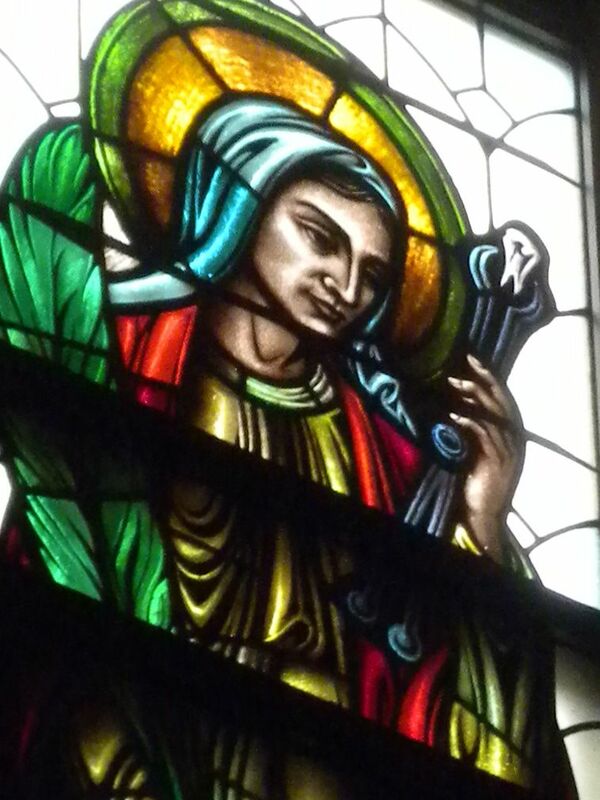 It's not every day that you find a saint studying a tooth in a stained glass window. The quirky homage to Saint Apollonia feels at home in a church where architectural conventions have been tossed aside in the name of modernity. Madonna della Strada is certainly the first Art Deco church I've seen, and it was fascinating to see such a unique approach to portraying old ideas like man's connection to God and the story of Christ. It's hard for me to believe that I've driven by it literally hundreds of times in my life, and never knew it was there, but I'm happy to have had the chance to experience this unusual piece of Chicago and ecclesiastic architectural history, right in my own backyard.